2Do from Guided Ways Technologies is a pretty feature-packed task manager and one of the ways you can sync iCal tasks with your iPhone. Originally designed for the iPhone and iPod touch, a major universal update brings 2Do to the iPad with style. Guided Ways has built a new interface for 2Do 2.2’s arrival on the iPad, carrying over the tabbed layout from the iPhone version but adding things like a small 30-day calendar and details about the currently selected calendar or project. A number of custom gestures are aimed at making the iPad version easy to use and navigate, including drag-and-drop for moving tasks and assigning due dates. A “Summary Dashboard” displays tasks that are due soon or overdue and more “Focus” options make it easier to do just that. A handful of new themes were also designed just for the iPad version. These new features augment 2Do’s existing support for projects, push and local notifications, and syncing with iCal, Outlook, and Toodledo. 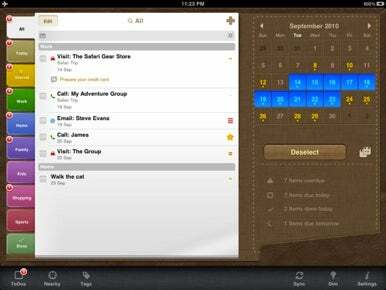 Other features include nearby tasks, tags, voice notes, batch operations, password protection, and smart calendars. One of 2Do's most interesting features is "Actions," which lets you attach things like contacts or maps to tasks. When it comes time to make that phone call, tapping the task in 2Do can open the Phone app or even Skype. 2Do 2.2 is available for $7 now in the App Store, and the universal update is free to all existing owners. It requires an iPhone, iPod touch, or iPad running iOS 3.0 or later.